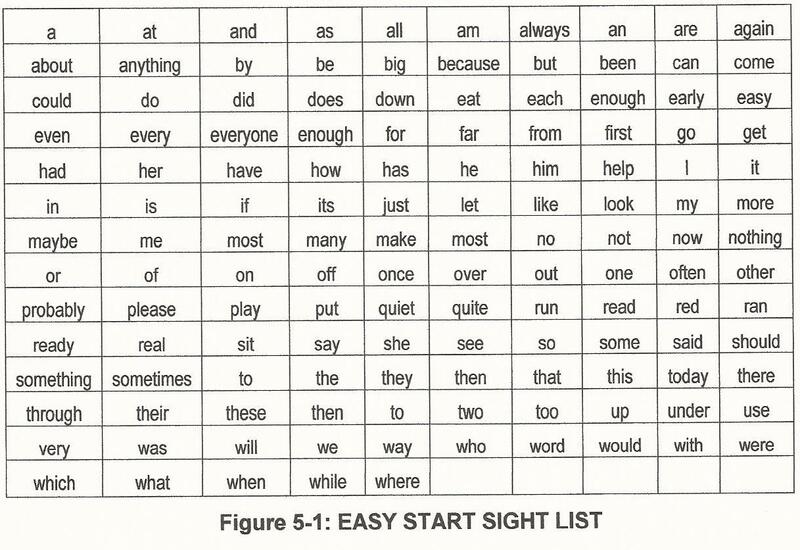 #Blog Burst 7 East Start Sight Words! Printable! Kids learn vocabulary in a variety of ways, but it starts with sight words! After the alphabet, make sure you are constantly pointing out basic sight words. Sight words are instantly recognized so no decoding (phonics) is necessary. Before you know it, your child is showing you the sight words. Sight words make up about half of all reading material, so it’s a good idea to spend time as a fun home project. This requires practice and repetition. Any parent, tutor or coach can teach sight words- no problem! Emerging, new readers and second language learners look for letters and words everywhere- in names, on street signs, labels, cereal boxes. Kiddos soon realize there are lots of places to find words they instantly recognize. Of course, you are always looking for and pointing out sight words in books. Sight words rock! Use any sight word list you like; this one is easy and a good place to start. The problem with sight words is that they are usually abstract, so it helps to say the words out loud, recognize them in as many places as possible, correctly spell the words and use often. You may want to label concrete household objects, known as realia or actuals. For example, print the words on lists, large or small charts, flash cards, word rings (shower curtain) etc. Perhaps label toys, furniture, kitchen supplies, whatever you’re comfortable with. Have fun! Keep a running word list, pack of index cards, etc. Play sight word games. Sing or chant sight words. Use rhythm instruments for a sight word beat. Look for the new sight words in a variety of books and other environmental print, outdoor signs, grocery store labels, in books and online. Here’s a super fun example of a sight word activity your child is sure to love! Take a look and perhaps do it this weekend! Check out Car Sight Word Knock- Down! Another fun idea to teach sight words: Squish and Squeak Sight Words! My variation, I made this using finger paint in small baggies which my students wrote on with fingers or cotton swabs. Make sure the bag is well sealed (check for leaks); it lasts for months! Make sight words out of play dough, wax sticks, pipe cleaners, modeling clay. Paint sight words on construction paper. Use sidewalk chalk. Pop-up books! Decorate the words. Put sight words in a recipe box! Make up a sight word dance, or act out sight words. Write easy sentences using basic sight words mastered. Since sight words can often be recognized by shape, use configuration or shape cues, such as the word ‘monkey’. Point out the distinguishing special features. If you are using a sight word “drill pack” of index cards, place the known words at the back of the pack. Keep reviewing the words, but focus on unknown words. The goal for teaching sight words is instant recognition, so your student can keep reading. Knowing sight words boosts fluency. Create opportunities daily to enlarge sight word vocabulary by creating a word wall in your house or classroom. Be aware of sneaky sight words that look and sound alike: be-bee; meet-meat; to/too/two; by-buy, etc. A reminder, since most sight words are abstract (what is a the) be sure to start with concrete words, as well. I hope these sight word suggestions are helpful. Let me know if you have questions or comments. I’m here for you! Be sure to keep checking my FB page for great resources, ideas, fun and inspiration. I’m also on Twitter @Rita Wirtz. 2 Responses to #Blog Burst 7 East Start Sight Words! Printable! Hi! I think the most helpful way to learn sight words is to watch videos.